We would love the opportunity to host your Spa Party! Our relaxing and welcoming atmosphere allows you the luxury to host a private or semi-private party. Your guests can choose from a variety of spa services for a customized experience or opt to choose from our popular spa packages. It’s the perfect way to celebrate Bridal, Bachelorette, Birthdays, Girls Day and also Corporate and Employee recognition events. Guests will have their large services performed, such as facials, massage or wraps, and then they will meet up in our Mani-Pedi Room. 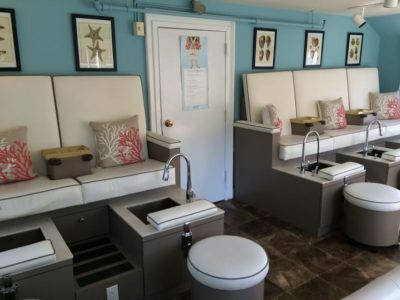 If party consists of only manicures and pedicures, the party begins with all the guests in the Mani-Pedi Room. 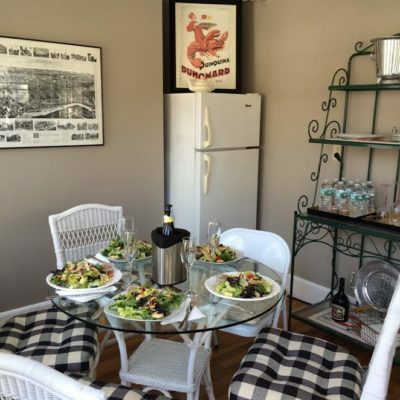 Guests’ provide their own food and beverages. 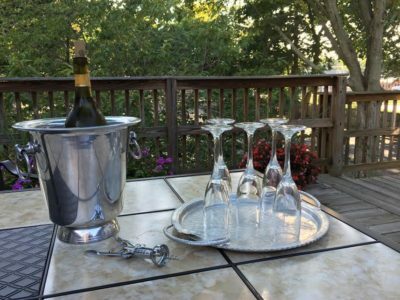 By the Sea will provide table set up with tablecloth, ice bucket for drinks and bottles, champagne or wine glasses, napkins, plates and forks. We will set your food and drinks right outside the manicure room for easy access. At the end of the party, we can help pack your food and drinks up for you. We also have outdoor areas, weather permitting, where you can continue your festivities! The charge for this service is $10 per person. Champagne, Prosecco, White Wine, Water, O.J. – No red wine. Cubed Cheese, Hummus or Dip, Veggie Platter, Sliced Fruit Platter, Crackers. Foods that can easily be used with a toothpick are best, to avoid smudging of the manicure. that can accommodate up to 7 guests. Bottled water and a complimentary glass of Chardonnay. Weather permitting, we can serve lunch outside on the upper deck as well. The charge for this service is $20 per person. All parties require a 50% non-refundable deposit to book a party. This fee will be used towards services. No Spa Finder/ Wish / Week can be used in conjunction with a party. Parties of 6 or more, having ala carte services receive 10% off services Mon -Thursday Only. Spa packages are already discounted. Therefore, they are not eligible for an additional 10%. We request one lead contact to coordinate deposit and party. If paying via credit card, we require one credit card as payment of entire party. Any service(s) not canceled 72 hours prior to scheduled appointment time and no-shows, will be charged the full-service price to the credit card used to secure party. Please check with your guests if they have existing shellac or acrylic nails. Extra time is required to remove shellac. We do not perform acrylic nail services. Our Massage Therapists, Aestheticians and Nail Techs’ services are not interchangeable. Therefore, changes to the schedule are very difficult to accommodate after party is scheduled. Please, no changes after party itinerary is confirmed. Please understand that we are a Day Spa where other guests are enjoying Massage or Facials during your Spa Party. Therefore we respectfully request you leave children under 13 at home. Date of Party, Guest Names, Services Desired and Deposit. It’s that simple! We also have outdoor areas weather permitting that you can continue your festivities.